After The Discipleship Series (2013), and Little Tough Tips on Marriage (2014) I was presented a third book by South-Africa based pastor and author, Taka Sande. 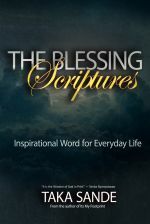 In The Blessing Scriptures, Sande gathered Bible verses grouped thematically. In total 33 topics like divine blessings, God’s power, wealth, obedience, giving and charity, prayer, etc. are backed up by sound bible quotes. Unfortunatel, context of these verses is stripped. Further explanation or personal application or testimony are lacking. The only twist is the use of several Bible translations and paraphrased versions, like the Amplified Bible, American King James Version, New International Version, and New King James Version. I’m not a fan of devotional books replacing reading the Bible itself. The context says so much more than just isolated snippets that is suggesting to address a topic and can be proclaimed or applied without further study or meditation. I challenge you as a reader of this book to look up the passage in the Bible, go through a larger piece of context a couple of times for proper understanding. Seek help from fellow believers with questions. Absorb it piece by piece instead of superficially browsing Sande’s book from beginning to end, without taking a learning path of a disciple yourself. Taka Sande is an author, entrepreneur and development activist. He has a passion for making a difference by influencing and adding value to people’s lives. He is the founder of the blog It’s My Footprint, and a leader at Hatfield Christian Church in Pretoria, South Africa.